Hydrokinesis is the right word to describe the ability to control water. You should spend sometime everyday learning to control water through energy manipulation. You may also want to meditate daily. When you learn how to control your mind first you will then be able to move on to bigger and better things. This is a spell to enhance your magickal abilities. On the night of the full moon go outside. Find an area where you can capture the moonlight in the water and mirror. When you find your spot place the glass bowl filled with spring water with the mirror in the center. Light the blue candle and meditate on the water. In Norse mythology, Ran is the water goddess of the sea. You can used another Deity if you please. After you have said the above take the candle and let 7 drops of the blue candle wax fall into the water. 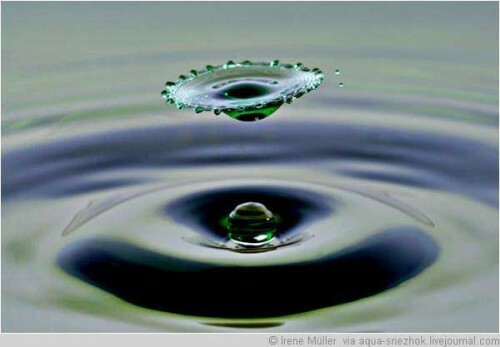 As each drop falls and ripples with intense concentration repeat “Water and I are now one”. Take the water and the bowl and practice daily to manipulation your energies to control the water. You shouldn’t change the water as it is now enchanted. When practicing you should use your concentration and silently chant “Water and I are now one”. Thank you to Moonlady for sending me this spell. Have you tried this spell to control water? You can leave questions, comments, suggestions and all else in the comment section below. Thank you for checking out this site. I post new spells daily so come and check it out!